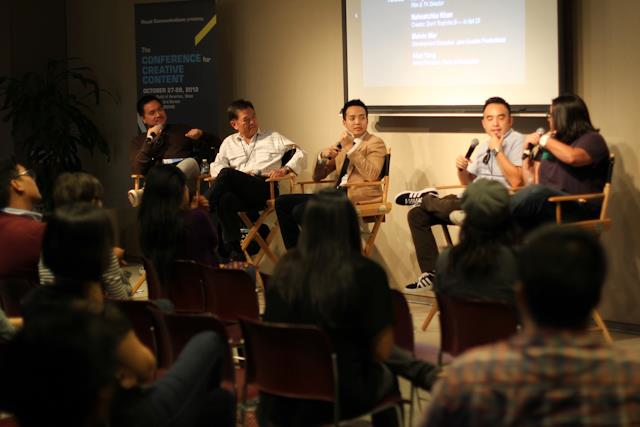 A panel at last year’s Conference for Creative Content. Visual Communications will present the third Conference for Creative Content (C3) on Saturday, Oct. 26, at SAG-AFTRA, 5757 Wilshire Blvd., Los Angeles. The premier entertainment media conference invites top industry professionals to speak about their craft, and engages the audience with interpersonal insights on the new directions in which creative visions are finding expression, especially from Asian American content creators breaking new ground. From cutting-edge film production hardware and software, to sustaining your online media audience. From writing for video games, to producing reality television. From transitioning from film to cable television, to producing motion graphics and mobile apps. C3 provides an arena to have a meaningful discourse in the ever-changing media landscape. Registration and light breakfast at 9 a.m.; introduction at 10 a.m.; seminars at 10:15 a.m., 11:45 a.m., 2:45 p.m. and 4:15 p.m. At the conclusion of the conference is a reception at The Counter, in the same complex as SAG-AFTRA, from 6 to 8 p.m. Registration fees: $40 for VC members and students, $50 for non-members. Parking facility is located north of Wilshire off South Curson Avenue. Parking voucher will be validated at the registration table.